I’ve had my Colnago C59 for three months now and I’ve been asked more than a few times what I think. until very recently I’ve been hesitant to make a statement because, to be truthful, I didn’t really know what to think. I’m ready now, and you’re about to suffer the consequences. Unlike people I haven’t met yet, I had high expectations going into this purchase. 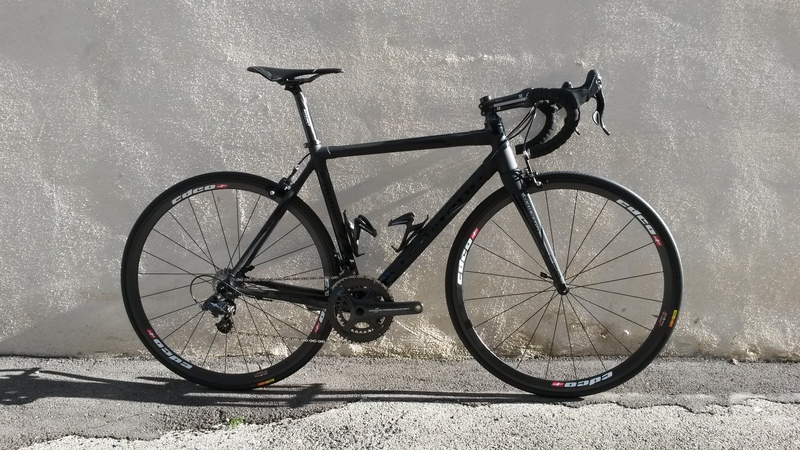 I did my due diligence on the internet and read pretty much every review there was out there and, to the blogger, everyone said that the ride quality of the C59 was the best they’d ever experienced (till the C60 came around, that is). I ‘knew’ that I was buying something special. I should mention that, to the blogger, there was a great deal of waxing poetically, too – you’ve been warned if you read further. The first thing I noticed, after measuring everything down to the last millimeter, was that my position was inexplicably but completely off. I fiddled with the saddle endlessly to try and set things right. This was what the bike looked like back then. That 3T stem is 120 mm and the FSA bars, although advertised online as ‘compact’, definitely didn’t feel like it (or look like it). I have a stubborn streak in me that forced my brain to think I could make it work somehow, but the truth was my front end wasn’t making me happy. All this, over weeks of riding, meant I couldn’t focus on the quality of my new bike yet, because everything was just a bit ‘off’. All I could confidently say back then was that it was faster (probably due to the wheels) and that it felt ‘solid’. I’m thankful that I went through a similar process with the Bianchi because I knew how fickle my body was and how much tweaking I needed to do to make the Infinito fit me like a glove. I gave in and took the C59 to the shop, where David swapped the 120 mm stem for one 10 mm shorter. That helped, but whenever I went into the drops, I was, well, dropping too much, and I couldn’t get used to it. A couple of weeks later we went back to Passieu and I bought a 3T compact set of bars, sending my others back to the online shop for a reimbursement (which I’m still waiting on). And now the bike looks like this. You’re right. It looks pretty much identical. It doesn’t feel that way, though. I’m now able to ride and not be distracted by poor position (although there’s still a half a mm or so to go with the saddle) and I have been riding enough, in lots of different conditions, to form an opinion. First, the goodness of the C59, to me anyway, is in its inherent ‘bikeness’. Where the Bianchi felt sprightly and just a tad jittery on the flats, the C59 chugs straight ahead, as if it was born to do so (it was). 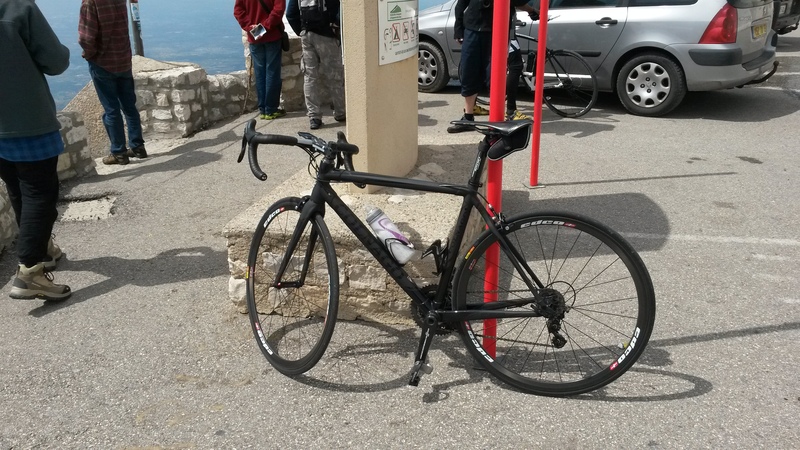 When climbing, I could easily whip the Bianchi from side to side, en danseuse, but the Colnago insists on calm, moving but keeping its line up the mountain. If I try and fight it, the bike fights back. If I learn the way it wants to move, it rewards me with a smooth climb. So far so good, but I really love to descend, and I’d heard all sorts of pronouncements of how the C59 (or any top-range Colnago, for that matter) went down a mountain ‘like it was on rails’. I’ve been struggling with the C59 on the descents and have even overcooked a couple of hairpins, which I almost never did on the Bianchi. Just in the past couple of weeks, though, I’ve been getting close to figuring out how the bike wishes to go down a mountain. I have had a few moments of enlightenment, but I’m not one with the Colnago quite yet. That being said, I have Strava to thank for giving me a more objective outlook on this and I’ve been getting personal bests on some descents, including a pretty fast one on Ventoux a couple of weeks back. What seems slow and awkward to me is actually kind of speedy. Once I discover whatever alchemy Ernesto weaved into his frame to make it descend ‘like it was on rails’, I’ll be set. None. I think this is going to be a lifelong learning experience. I don’t go looking for KOMs, either on descents or climbs, don’t worry! Nice to see a man working at it. My loud sounds are coming from squeaky tendons and not my bike. No doubt about it man, that is one beautiful bike. I was lucky when I bought my avenge… I jumped from a 13 year-old Trek 5200 that had seen its better days to THAT. The difference on a descent (same stretch of road, same mountain) was astounding – 11.8 mph faster… 45 on the Trek was a little scary. 56.8 on the Venge was sturdy and steady. I could have comfortably added another 10 mph without getting squirrelly. Sometimes a new bike makes a big difference; sometimes not. I’ll be working on improving the ‘engine’ (and my descending skills) this summer, just in case. Indeed. Good luck Gerry. Incidentally, I paid a little bit more attention climbing with the Venge today… I don’t toss that bike side to side like I can my Trek, same thing you experienced. Don’t know why it’s like that, but it is. Auto correct changed “Venge” to avenge. I often despise auto correct. For your position, did you try to match your Bianchi position, specifically, seat height, offset from BB and saddle to bar length? I’m curious why you should feel so different on position. The geometry and frame differences would certainly change the feel of the bike in motion, but you mentioned position, which sounds more like a static difference. You’re right, Rich, which is why I was/am so confused. I think one issue may be how I’m measuring. For example, the ‘saddle setback’ is pretty tricky to nail, at least the way I do it (with a plumb line). I’m guessing that, and maybe the BB-saddle measurement, might have been done slightly different with the Bianchi and the Colnago. It’s the only conclusion I can come to (human error). I’ve had similar problems measuring my inseam…it all depends how far you ram the book (or whatever you are using to mark the wall) up your crotch! My flexibility improved in recent months, and I suspect it to be the cause of my new found discomfort with my current saddle, which used to be very comfortable. However, it does seem to provide evidence that Fizik’s theory of saddle design based on rider flexibility is valid.